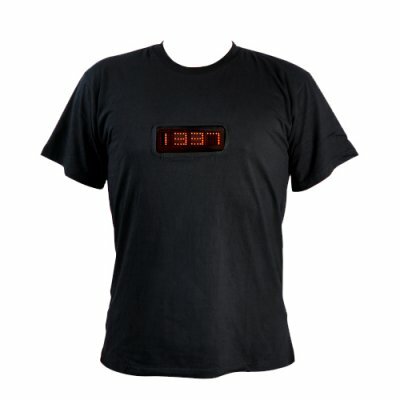 Successfully Added LED Shirt with Time and Programmable Message Display (Medium) to your Shopping Cart. LED Shirt with Time and Programmable Message Display: Don't be afraid to show off your inner geek. After telegrams, voice calls, SMS, emails, we are glad to introduce the newest and coolest way of communication for generations to come: customizable LED messages sliding on your chest! With this unique LED Shirt, you can display and edit 6 different sentences, logos, mottos or just names of up to 255 characters each! The brightness is adjustable, and the speed and way of displaying words can be chosen among a medium choice of pre-registered modes. Finally, a way to let your inner geek out! The use and fun of this awesome LED Shirt is infinite. If you have your own business it is an ingenious opportunity to advertise your company website, special promotions or any other great marketing ideas to attract more customers. Imagine the effect you will generate by sending staff wearing shirts with lively LED messages in crowded areas! Let's not even mention the effect of this LED shirt in parties, bars and clubs... just 3 words: Instant Chick Magnet. No hesitation, order your awesome LED Shirt with Time and Programmable Message Display right now and feel like a star! Also make sure to promote it on the front page of your online store and it will rain cash into your bank account. Once again it is brought to you by the leader in top gadgets and electronics, Chinavasion. A lot of modes are pre-registered so select the one(s) suitable for your business or amusement! Gets a lot of attention! To type a message, first you have to choose a number between 1 and 6 in switch mode, then go to input mode and select a character. To proceed to the next character, simply press enter to validate the previous one. When it is done, wait for a while and the message saves automatically. To type another message, choose another number in switch mode (if you choose the same, you overwrite the previous one) and then follow the same steps. The time displays when no message is selected.